A new species of typhlogammarid amphipod has been discovered in two caves of the southern foothills of the Greater Caucasus mountain range in Georgia’s Abkhazia region. 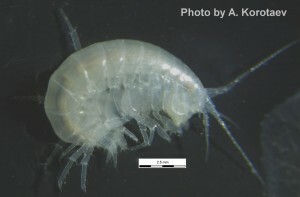 Described in a study published in the open access journal Subterranean Biology, the new amphipod, which belongs to the genus Zenkevitchia, is only the second species known from this group. This new addition to the genus is named Zenkevitchia yakovi after the famous Russian biospeleologist Professor Yakov Birstein. Found in Istočnik Tcebel’da and Sredne-Shakuranskaya caves, these typhlogammarid amphipods are a part of a group of blind and unpigmented endemic Balkan-Transcaucasian cavernicole crustaceans, which inhabit subterranean rivers and lakes. Researchers believe their modern distribution is the result of marine transgressions from bygone eras. Despite the first member of the genus being described over 75 years ago, this group of cave critters is still understudied, with little known about the biology beyond their unique “filtration mouth parts” adaption. For instance, while most species can be easily differentiated on the basis of morphological analysis, Z. yakovi has no reliable morphological differences with Z. admirabilis and was only differentiated by sequencing of the barcode region of mitochondrial cytochrome c oxidase I (COI).